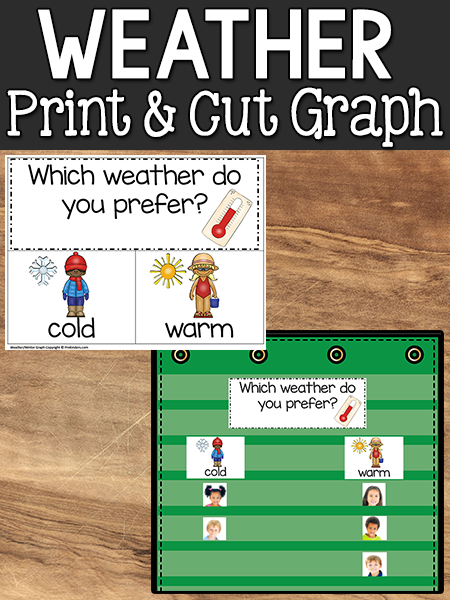 Here’s a Weather Graph you can print and cut for a simple and quick large group activity. You could use this with a Weather Theme or Winter Theme. Over the holiday break, I worked on a set of printable graphs that would be easy for teachers to print and prepare. I just printed out this graph, “Which weather do you prefer?” to use with my class this week. Coming back after a long holiday break, it’s nice to have a printable activity that doesn’t take much time to prepare. To prepare the graph, all you need to do is download the printable at the link below, print it, cut it, and either use it on chart paper or in a pocket chart. If you want to reuse this each year, you could laminate it and use it in a pocket chart. Or, just attach it to chart paper with glue or tape to have a chart you can post on the classroom wall. Sticking a sticky note with their name on it on the chart paper graph. Placing an index card with their name on it in the pocket chart. Sticking a snowflake sticker or foamie sticker on the chart. Placing a photo on the chart (print and copy black and white photos on the copy machine). This weather graph is a sample from a larger Graph Kit I posted in my Teachers Pay Teachers shop. 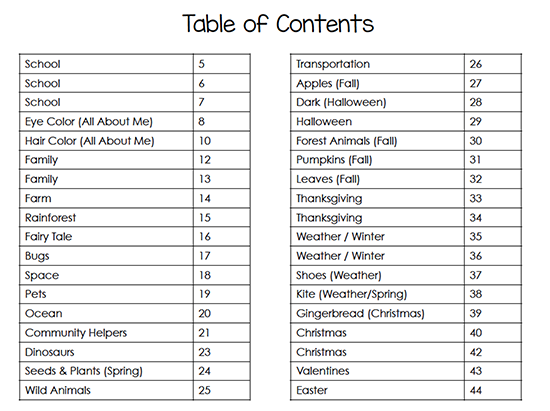 There are 36 printable graphs for holidays and themes. If you used one of these graphs each week, it would cover a typical school year. I have other sets of graphs in the works. Here are some examples of the graphs you will find in the pack, including the Table of Contents page and Directions page. To purchase this set, click here: Graph Kit. You made my work easier ! Great ideas and love the easy prep for the graphs. My headstart is very big on graphs but I always have trouble with writing the headers…. I am also a headstart teacher and they indeed are big on graphs. They are also big on children composition of materials displayed. What have you found to be the best strategy incorporating child centered development in a certain area in the classroom. ?What works best for you and the child when it comes to teaching the alphabet and it’s sounds? I find that if, In the beginning of the year, the children learn to “write” responses even if it just looks like scribbles & they say something else each time they are asked what they wrote. This helps them learn that print carries meaning & slowly when they learn the abc formally they start putting down those abc and you can start reading what they mean (sort of… ) ;). I use clothepins with the students name on each side to use with graphs. 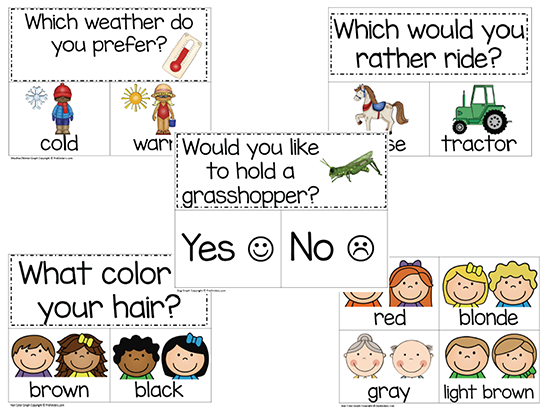 Children need to use a pincher grasp and problem solvie as they decide how to orientate the clothespin to use on the left or right side of the graph. I am so grateful for the awesome work that you do. You have put a lot of thought and time, which I do not have the time. Thank you so much!! Once again a big thank Karen.